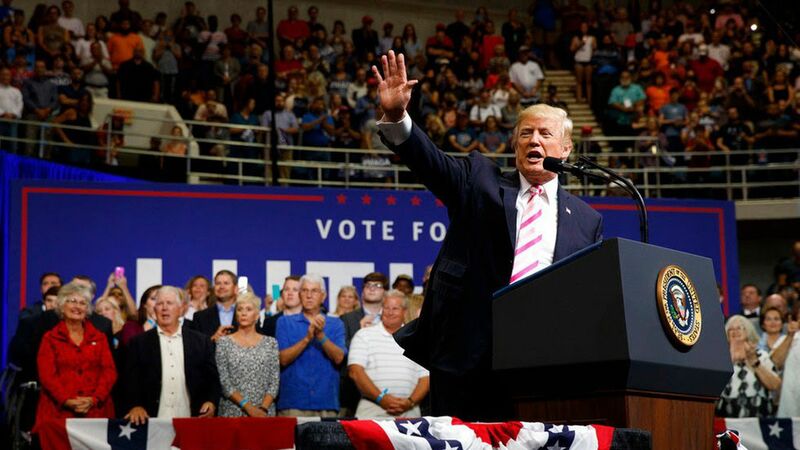 Trump taunts NFL protesters: "those people"
Commentators predicted a new wave of protests by athletes during the national anthem after President Trump used coarse language to tell a rally audience in Huntsville, Ala., last night that NFL players who take a knee should be fired. "The only thing you could do better is if you see it, even if it's one player, leave the stadium, I guarantee things will stop. [Applause.] Things will stop. Just pick up and leave. Pick up and leave. Not the same game anymore, anyway." The out-of-nowhere riff, which trigged an instant online backlash in support of athletes like Colin Kaepernick, was part of a 1 hour, 20 minute ramble by Trump. He was speaking in support of Sen. Luther Strange (R-Ala.), who's threatened by Breitbart-backed candidate, Roy Moore, in Tuesday's primary. Why it matters: In appealing to a Deep South audience, Trump waded into culturally sensitive territory that could freshen opposition elsewhere, and ignite a debate wholly unrelated to anything he's trying to accomplish. To address a largely white crowd as "people like yourselves," and refer to protesting athletes, often African American, as "those people," does nothing to heal the wounds of Charlottesville. The reaction ... USA Today columnist Christine Brennan, on CNN: "I think we're going to see, potentially more NFL players taking a knee this weekend than we ever would have thought ... maybe even college players, too." "My sense is that ... players are angry." "There's a more important issue about the health of young, American athletes. And obviously the president wasn't too concerned about that tonight." "Right? They're ruining the game. Hey look, that's what they want to do. They want to hit, OK? They want to hit. But it is hurting the game." Be smart: Trump's NFL comments were generationally based, with the president inviting portrayals as a 71-year-old unfamiliar with the latest medical research, rather than a leader in touch with the concerns of rising generations of doctors, athletes and fans. Flashback ... Trump at a campaign rally in Lakeland, Fla., in October: "See, we don't go by these new and very much softer NFL rules. Concussion? Oh! Oh! Got a little ding on the head — no, no, you can't play for the rest of the season. Our people are tough!"